Any time I have a new branding client, we have a discussion about the foundation of their business and their values. Sometimes this can be a surprise to clients or they might wonder why we are talking about their values of their brand. Some people that work with have tried branding and creating their business and never have decided on clear values and this can be a huge mistake. That's why we want to explain why deciding your values are important and the action steps you can take to define your brand values. The important thing to remember is that you have personal values and you have brand values. Think of your business as a person, what would they consider their values? Most entrepreneurs are extremely close to their brand or might even be the face of the brand, this is when personal and brand values may overlap. I think most people skip the idea of defining their brand values because they don't understand the importance of doing so. I'll be the first to jump up and raise my hand that I didn't know why or what my values were when I first starting turning graphic design into a business. I remember thinking "what do values have to do with my business?" and also thinking “that’s just what big corporations do” But as you begin to get more clients, grow, and work hard, you start understanding why these principles should be put into place. One reason that defining your values is important is because it sets the framework for everything that you do in your business. Your brand should follow these values whenever you make a decision. If you are unsure of a project or a client, you can check in with your values and decide if they align with each other. Most likely, if your values don't align with your clients, the experience can be hurtful to both parties. Maybe you're asked to be featured on a podcast but that podcast doesn't share the same values or their audience wouldn't align with your brand, then you know that you should decline that podcast interview. Another reason that defining your values is important is because it helps you align your "why" with your customers beliefs. If you haven't heard about the Ted Talk by Simon Sinek "Finding your why" then you should probably go watch this video. Anyways, he talks about how people don't buy what you do, they buy why you do it. So when your beliefs match your customer's beliefs, they are more likely to purchase from you. One way of showing how your beliefs align with your customer's beliefs is by defining your values and making sure the decisions you make for your brand apply to those values. This makes it easier for your customers to trust you, understand you and connect with you. Defining your brand values lets you also create a company culture and if you’re hiring a team then you know what values in them to look for. Finally, the fourth reason is what made me want to write this blog post. A majority of small businesses never define their brand values and this affects their brand, their decisions, and their target audience. Your branding will be much more aligned, effective, and meaningful if you define your brand values. Your brand values give off certain tones and messaging and your branding needs to reflect that so that you can attract your target audience. Your messaging and design both change depending on your values. I always see people rebranding and starting their brand to go in a different direction and I found that majority of people just don't have a solid foundation in place and haven't actually taken the time and created a list of what is important to them. When your brand connects with your messaging and your emotions, then you will start attracting your dream clients. Now that you know why your values are important, we want to share with you just one of the ways we work with our clients to define their values. We created a download so you can just circle and fill it out but if you do not want to download the pdf, then here are the steps so grab a couple pieces of paper and a quiet spot. On a piece of paper, at the top, write the question "What is important and unique about my brand that I feel the most aligned with?". Then begin brainstorming all the values that come to mind and answer this question. Like we said earlier, some of these values might be personal and some might be business related. Write down all the important values that come to your mind. Also, at this moment avoid looking at a list of values. We want you to come up with ones that resonate with you. You can have about 20-25 written down. Think of positive life experiences and try to think why those experiences were positive. For example, when was the last time you were impressed by a customer service job, and what did the person do that made it a pleasurable experience? Does that value align with your brand? Think of negative experiences that you've had with clients, with other brands, or in life that got you really frustrated. Decide why those were negative experiences and what the opposite positive value would be for those. For example, when someone is being shady on the internet or using marketing techniques that are just meant to scam their audience, it really frustrates us to the core, that is why we value honesty and transparency. Once you have your brainstormed list of values, grab another piece of paper and you're going to group the values to their similarities. For example, if you wrote down "elegance" and "formal" those can be grouped together in a category. So continue to categorize your values into 5 categories. If you have any that don't fit into these categories you can place them to the side. Now, you're going to look at a list of values, we've included ones below for easy reference. Now you're going to use these values to name those 5 categories. The reason we are having you look at the list afterwards is because we want you to pick one concise word that encompasses all the words in the category. 6. 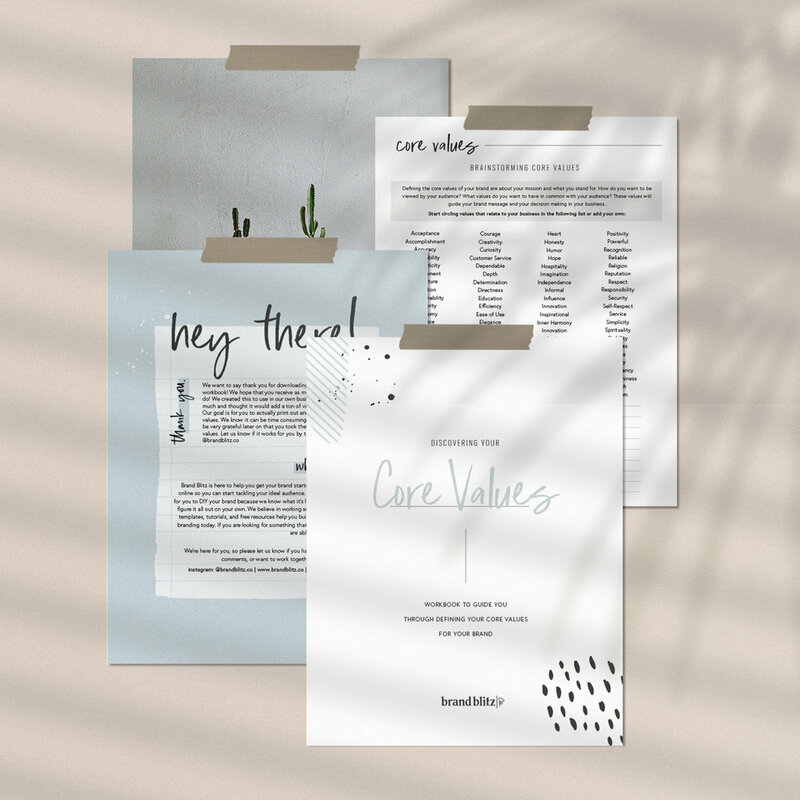 Once you have named your five categories, you are going to take your final list of values and write down why they are your values and how they apply to your business. We include examples of other companies so you can get an idea of how they structure them. 1. LOVE ATHLETES. Make things that make them legendary. 2. STAND FOR EQUALITY. United we win. 3. FIGHT ON TOGETHER. Adversity fuels victory. 4. CREATE FEARLESSLY. Dare to lead. Never follow. 5. ALWAYS CONNECT. Live at the center of the consumer’s life. 6. STAY TRUE. Completely honest. Perfectly imperfect. 7. THINK BEYOND. Better athletes in a better world. 8. CELEBRATE THE WINS. Take time to take pride. You can search most large companies brand values but remember, this is about you and your brand. A lot of large companies have more than 5 brand value statements, but some of them still target the same core value. This is your business though, you choose how many you want. Define the values and what they mean for your company, and how to make actionable steps for each value. Your work doesn't end here. 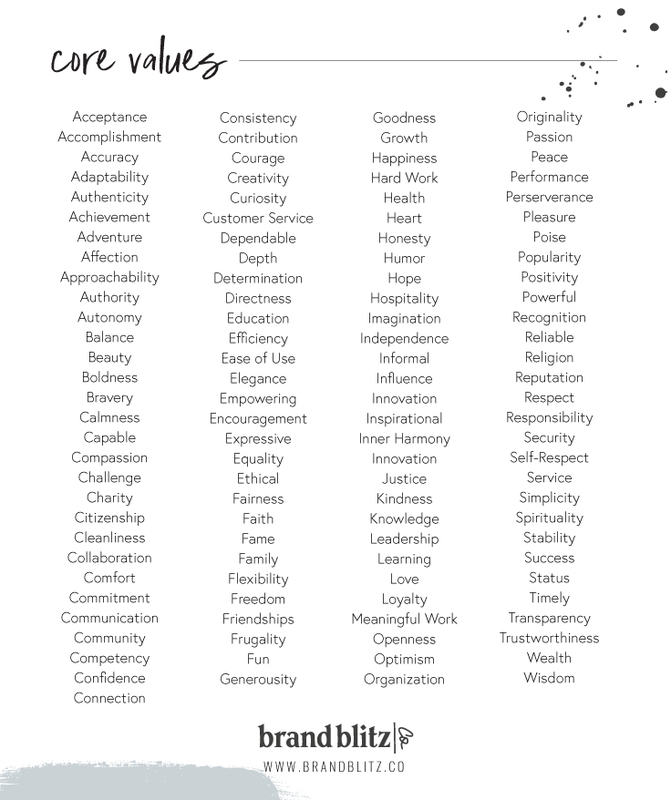 These are values that should be intertwined with all your products, services, and everything that you do. Here's a quote that Amazon put on their brand values page, "We use our Leadership Principles every day, whether we're discussing ideas for new projects or deciding on the best approach to solving a problem. It is just one of the things that makes Amazon peculiar." Print these out, keep them close, and have them present if you're ever struggling on a decision. Extra Credit, putting values on your website! (If you decide to add your values or have them already on your website somewhere, send me the link! i'd love to see!